Do pets provide social support? 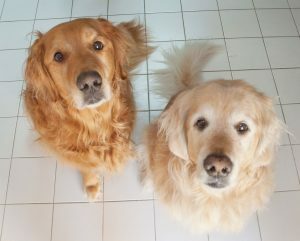 Home » Do pets provide social support? Dogs and cats are as important to owners as are siblings and parents. Those relationships can provide a protective mechanism, as pet owners are both physically and emotionally healthier than their non-pet owning peers, according to 3 studies that have been conducted. Pet owners were found to do better in several well-being measures (eg. Self-esteem, exercise/fitness level, loneliness) and individual-difference measures (e.g. More conscientious, more extroverted, less fearful and less preoccupied). I know when I come home after a long hard day, and Yukon and Charley greet me at the door I feel 100% better — my stress just melts away looking at those beautiful faces. Think of your pets as friends with benefits. Yukon and Charley greeting Dr. Fulop at the front door. Source article: J Pers Soc Psychol 101:1239-1252, 2011.